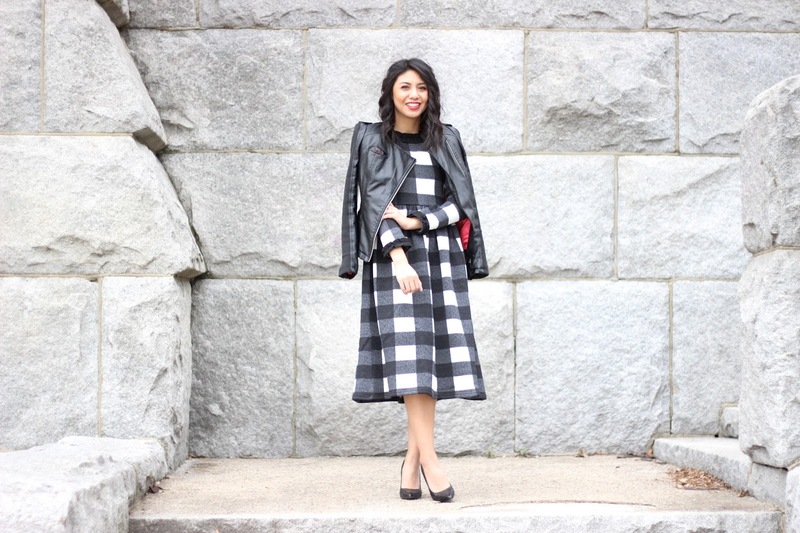 In case you haven’t noticed, I have not been wearing any dresses on the blog recently. In fact, I have been avoiding them. Regardless of the mild winter we are having (and I mean extremely mild for Chicago! ), my tolerance for cold weather gets worse every year. I really don’t know how I was able to do outfit posts with dresses during the winter in the past! So when I came across this gingham sweater dress, I was slightly nervous about wearing it outside. To my surprise, the dress described exactly what it is – a sweater! I love the quality and material of the dress. I love the thickness of the fabric. It’s cozy and warm. It feels like a fleece blanket! But that’s the thing about Dainty Jewell’s collection, their mission is to create modest clothing out of the highest quality. They stick to their word! Dainty Jewell’s believes that every women has the right to express their fashionable side without giving up their modesty. I love a brand that supports women! They support women across the world who desire to be presented as international ladies. Plus, how fun are their dresses! I have my eye on the Serendipity dress too. It’s just too cute. I decided to go for a dress that is more versatile. I mean, who doesn’t love gingham?! The fact that it is a sweater dress won me over because it is so hard to find a true sweater dress and this is the perfect dress to wear in cooler temps! I also love how I can easily change the look of the dress. I can keep it conservative and relaxed by wearing the dress with just heels. For this post, I was feeling edgy and added a moto jacket to give it a touch of a ‘cool’ vibe. Depending on how you accessorize the dress, it can easily look work appropriate, date night, girls night, or just a day to wear a dress! Such a cute dress! Love that pattern on you! Ohhh girl, I am obsessed with this dress! You know my affinity for them. A midi with sleeves?! So good. I love the message that fashionable pieces don't have to be immodest. Love it with your leather jacket. So glad to hear you like it!! Thanks Amy Ann! OMG so adorable, love it!! This is super adorable Rach! I love how you added some edge with your leather jacket too! Aww, what an awesome dress! It looks so great on you! I tend to avoid skirts and dresses at this time of year too. I just can't handle the annoyance of wearing tights and the fact that they don't really keep you warm. 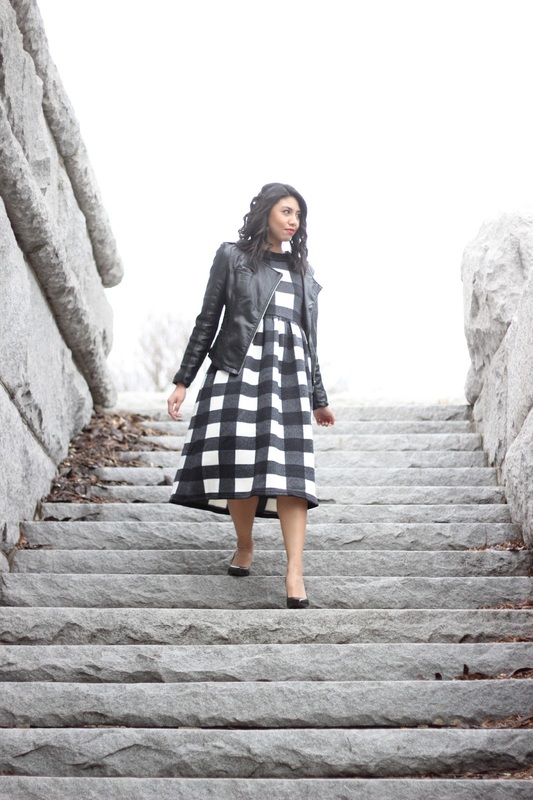 Freezing or not, it was totally worth bringing out this dress to share on the blog. It's gorgeous and I LOVE how the leather jacket adds that cool factor! I totally feel ya! Thanks Jackie! you pull off every style!! I loved this post! Thanks so much for sharing, I hope you have a great day! Much love! I always try to avoid wearing dresses, too, lol. So I've seen a sweater dress, and I've seen a gingham dress, but I think this is the first gingham sweater dress I've ever seen. You pull it off well. Glad I'm not the only one lol. Thanks Cheryl! This dress looks lovely on you! It also looks quite warm … as far as dresses go. What a cool dress, I love the print! I love that dress! It's so classic! Your dress is so cool! Its nice to feel warm. LOVE this!! I love the pop of red on your lips and the jacket! So cute Rach!!! I am loving this dress! So pretty! lovely outfit, you look beautiful. That dress is so pretty ! Love the large gingham pattern on such a cute dress! Love the look my dear! I love the jacket!! So Beautiful! Real cute. Like rock n roll vintage mod! 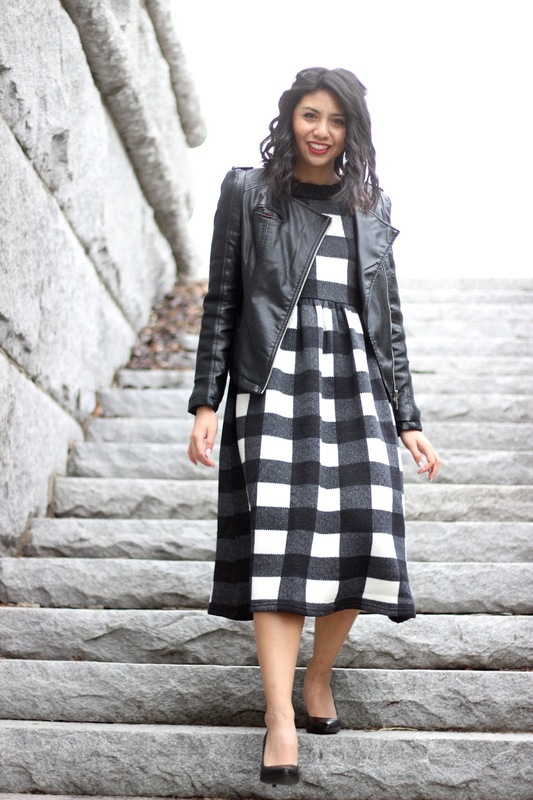 I love the juxtaposition of that cool Moto jacket with the sweet and girlie sweater dress! So chic! Saw this outfit on your IG…. love the dress!!! I couldnt believe it was a "sweater" dress. It's so pretty and I love the plaid! I love the jacket you wear it with! Right?! It's so awesome. Thanks Lily! Great outfit! Absolutely love that gingham dress! Love your dress! You looks beautiful! I love how you brought some edge to this look with a leather jacket, you are killing it! Such a classic print on a stunning silhouette! This is beautiful and you look great!! Have a wonderful weekend! Thanks so much Lauren! Have a great weekend as well! Lovely images, you look fantastic! You look fantastic. All you need are some SPECtacular sunglasses for the sunshine, check us out. Thanks for sharing and check out our Valentine's Day Special! Love the big checks! And love how u styled it with leather jacket and pumps! You look great. I love that dress, it's perfect! Cute outfit. That dress is so beautiful! I am obsessed with this dress! You look so cute, and the leather jacket ties it all together! What an lovely dress. You look gorgeous. The background is special those big bricks. 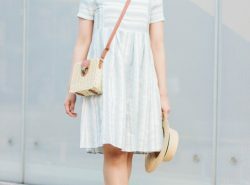 I did not know this Gingham dress was a sweater dress until I read your post because I had assumed that it was a cotton dress. This dress is perfect, it oozes elegance, edge, chic and it is warm! I love how you styled it and your makeup is done perfectly to suit the style. You look stunning! The sweater is such a lovely surprise!! Thank you Meron for the sweet comment! gorgeous as always! 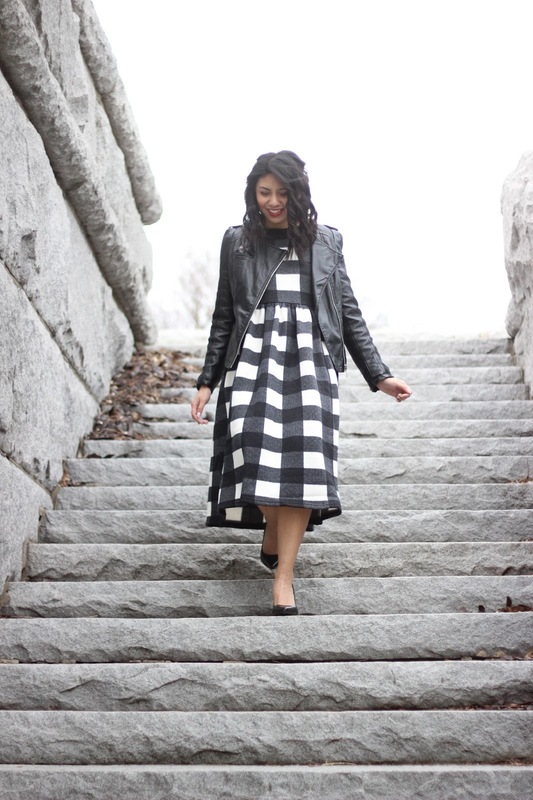 this gingham dress looks amazing on you! i absolutely adore that dress…love it!! Totally did not guess that that was a sweater dress! I thought it was cotton and thought you were crazy for wearing it out in a Chicago winter, but now that I see that it's a sweater dress, I completely commend you on this look! Are you enjoying all of today's snow? Haha no way I can wear a dress now! It is FREEZING!! I love this print, so amazing. Count me in as a big fan of this sweater dress – Have a great week!! !